Join Borgy on a journey to outback Queensland to check out all the crazy action from the 2017 Big Red Bash. 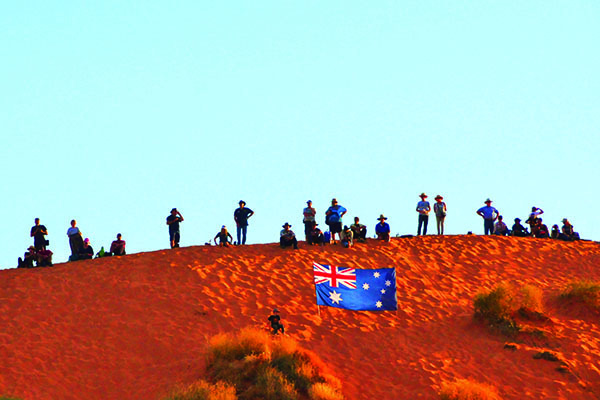 Geez, I’ll tell you what, a trip to the Aussie outback should be on everyone’s bucket list. I mean seriously, those desert sunsets are simply incredible, especially when that pink coloured haze starts to take over just as the sun drops over the horizon. The characters you meet out there are pretty much guaranteed to put a smile on your dial too, and that chandelier of stars, well, lets not get you too excited, eh? Yep, an outback adventure is always pretty hard to beat, but I’ll let you in on a little secret; it can be improved! How, you ask? 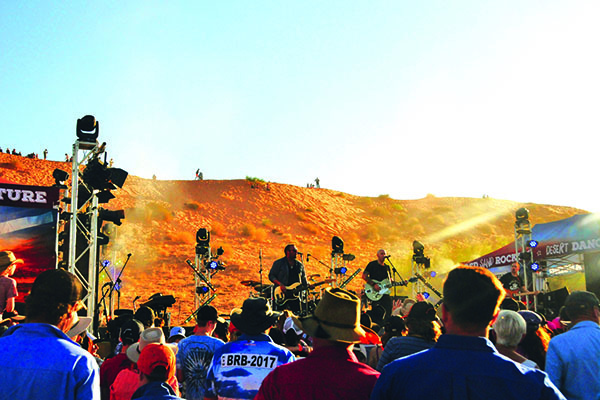 Well, you can start by planning it around one of the best outback concerts in Australia – Birdsville's, Big Red Bash! Yep, after having an absolute hoot out there in 2016, there was no way in hell I was going to miss it this year! But instead of doing the mad dash out there and back in the space of a week or so like last year, I thought it best to ring every last drop of fun out of this adventure and turn it into an epic month long stint in the outback with the handbrake, errrrm I mean the Mrs. Yep, it’s time to head bush and show Mrs Borg what I’ve been calling work for the best half of 7 or so years! Something tells me the old hard-days-work sympathy card won’t work too well after this, eh? This time we thought we’d stop in at a bunch of privately owned station stays along the main touring route out there. If you’ve never tried camping at a station stay, trust me, it’s well worth looking into. The first stop was supposed to be at an absolute pearler of a spot at Trilby Station on the Darling River, but unfortunately it rained cats and dogs all bloody week and the road in was closed again – that’s the second time that’s happened! Not to worry though, my old mate Johnno told me about another spot just a few clicks outside of Cunnamulla called Charlottes Plains. It’s a 70,000-acre working cattle station that welcomes campers to come out and relax for a few days to take it all in. Now, I’m not going to muck around here—if you ever find yourself in that neck of the woods, there’s an Artesian Bore that's definitely a hot attraction. I mean that quite literally too. You see the water temperature is up over 40 degrees! Yep, you read that right. Now you can swim in the main water hole, but take it from me – you don’t want to be in there any longer than 15-30 minutes, unless you like being dehydrated and fainting. From Charlottes Plains you’ve got a sensible two to three days drive into Birdsville for the bash. 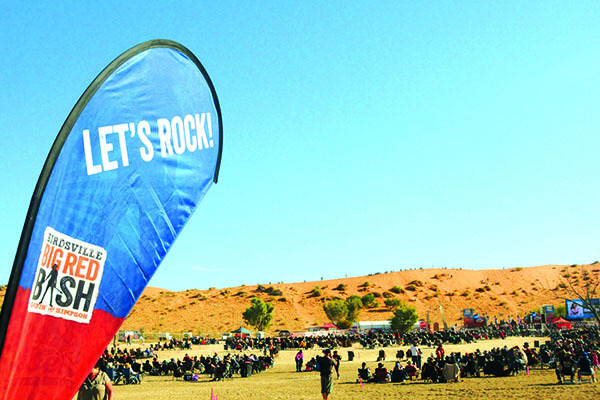 Here’s a fun fact for you if you’ve never actually been—the concert itself is held at the foothills of the Simpson Desert, with none other than the largest sand dune of the lot (Big Red) providing arguably the best concert backdrop in the country. Trust me, it’s every bit as epic as it sounds! This year, Lee Kernaghan headlined the act with country music legends like Troy Cassar-Daly, The Wolf Brothers, Ian Moss, James Reyne and Missy Higgins to name just a few. You know what makes this event stand out from the crowd? It’s the atmosphere. More specifically, how it encourages the artists to deliver a more personalised performance during their time on stage. One thing’s for sure: nothing beats rocking live music on the edge of the desert – but geez, I hope we didn’t wake the neighbours! There were smiles for miles as the kids (the big ones too) slid down the dune on their home-made sleds, and plenty of entertainment with the event hosts – The Crack-Up Sisters! Think whip-cracking with a bucket load of old-school country humour thrown in for good measure. Now the event is super-cool, but truth be told, it’s not the only reason everyone makes the trip out this way. Nope, the local bakery sells the best pies in town! Ok, so they’re the only pies in town, but trust me—with crocodile, camel and a bunch of other exotic outback meat-pie goodness on offer, it’s well worth the trip. The lamb shank selection will have your tastebuds doing full-blown cartwheels! The Birdsville Hotel is another must-do. It’s a true outback watering hole that sells cold beer and bucket-loads of outback charm—enough said, right? 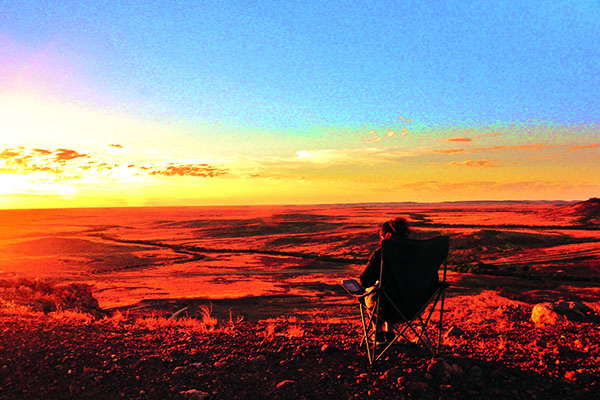 If that’s not your scene there’s plenty for the keen 4WDer or camper to explore, starting with an overnight trip out to Poepells Corner, which is always a winner; and if you wait until after the event, you can have a crack at driving the Big Red dune, too. If heart-throbbing sand-flicking hill-climb attempts don’t get your motor revving, you could always try your luck down at the river catching yabbies. I gave it a go, but it turns out you need to have half a clue what you’re doing to be successful—that counted me out! Ok, so we’ve all heard of a two-for-one deal, right? Well, this one is definitely worthy of its own infomercial. Yep, just two days after attending the Big Red Bash, you can make your way to the Bedourie Camel Races, which are a bit like the Melbourne Cup, only there’s no horses and a lot more flanno shirts. Seriously though, it really is a great event. I mean we didn’t even make it out of the car park and the commentator had us in stitches as he called the first race. If you’ve never seen a camel run, it’s worth pointing out they’re not the most graceful to watch, but are wildly entertaining, that’s for sure. It’s even more fun when you back a winner! All for local fundraising, of course. If racing camels isn’t enough to give you a giggle, I’m pretty certain the pig races will. 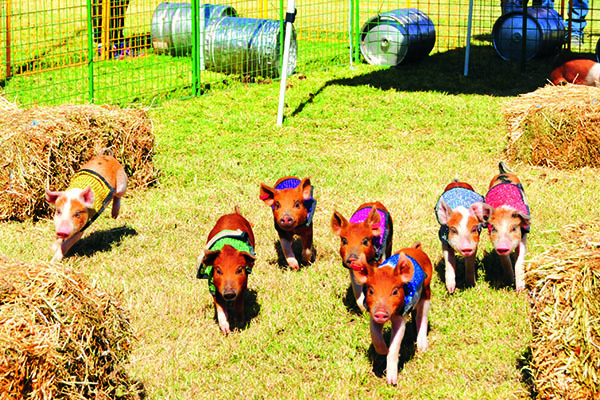 Just imagine eight little piglets dressed in sparkly coloured gowns running around an obstacle course, with no less than a thousand smack-a-roonies up for grabs and a few hundred fans cheering them on. Trust me, with the announcer throwing in quotes like “would you check out the hamstrings on this beauty” or “This pig is a guaranteed a finish in the top eight (only eight pigs there)” you can’t help but smirk, chuckle or wet your bloody pants! Wood-chopping was another fiercely competitive competition, well kind of. The local fellas took out the win, but with blunt blades and green wood, I was pretty impressed everyone got through it in one piece—I’m pretty sure I'd still be there chopping away now, if it was me. Nope, I reckon my forte is more along the lines of the damper cooking competition, if you couldn’t tell by my overly athletic figure. Speaking of athletes, when the camels weren’t on the track it was time for the humans to have a crack. Yep, there was running races all day—even the oldies had crack, although I did notice the ambulance was lingering close by. Trust me; this is a fun day for all and definitely worth hanging around for after the bash, in my opinion. 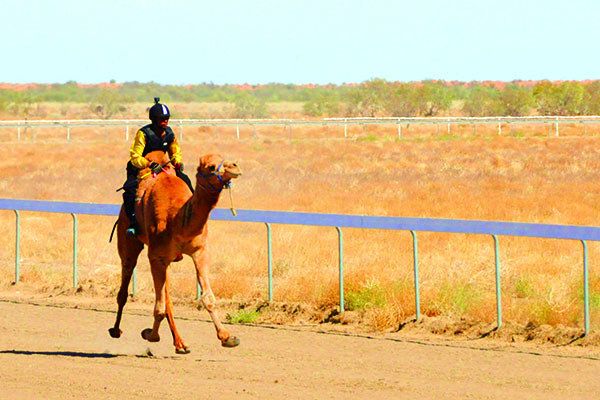 Heck, you could hang around the extra week and check out the Boulia races, which are supposed to make the camels and piglets look like local mice races!